We had a Thanksgiving meal a day or two ago at our place. I made sure that I had raked a large pile of leaves up on the front lawn so that Hurricane and Tornado could play in it the minute they arrived. 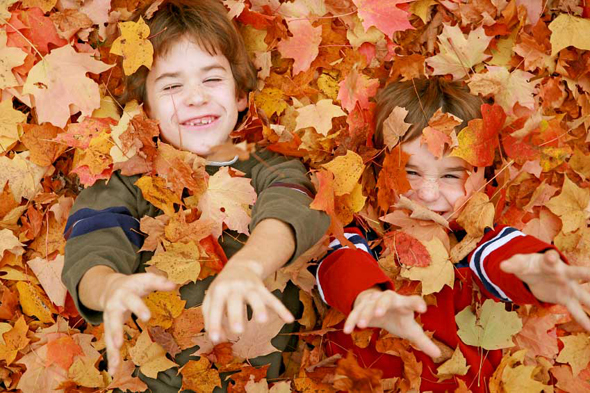 Kids love leaves! I suspect that if it were possible to measure, we would find that leaves love kids as well. Today was the perfect day to watch the leaves to fall from our trees. There was a gentle wind which would swirl the mainly golden leaves around as they floated to the ground. Every now and then a leaf would bounce off of the window, taking me further back into my memories of autumn. One of the things I loved about growing up in Southern Ontario was the massive amount of leaves that would accumulate pretty much everywhere at this time of year. I would walk to school dragging my feet through leaves that were mid calf. The sound of rustling and crunching leaves almost made the walk to school enjoyable. If I were walking anywhere but school it would have definitely been enjoyable. My brother and I would have to rake the leaves up in the back yard several times during the leaf dropping season and the piles were large and magnificent. We would bury ourselves under the leaves, just peaking out at the world, pretending we were fighting the Nazis or the Japanese. We would have leaf fights with the neighbour kids and we all attempted to do back flips cushioned with a thick layer of leaves. My dad must have loved leaves too. He once told me that he would ride his bike through the piles at the side of the road. Well he did until he hit a brick that was hidden under those leaves. He wore the scar on his lower lip where his tooth punched through the skin. Today, I was killing time while Louise was shopping and I found a well treed area with piles of leaves on the ground. I shuffled my feet and that rustling sound turned me into an eight year old boy again. I just wish that Hurricane and Tornado were with me, they would have had a ball. It is much easier for them to be buried in a pile of leaves than fat old Poppa. I still like it, but it is far more enjoyable covering squirming, laughing kids. The other day Tornado and I would fill our hats with leaves, face each other and say “Good day sir!” as we lifted our hats and watched the leaves fall down around us. I doubt I will ever forget the laughter from my grandson and the laughter from myself. It was one of those few moments when four year old Tornado met four year old Poppa. Time travel at its best!